Green Cleaners - Make your Own or try some Eco Friendly Products. I did take the easy route and get it shampooed and was left with a vanilla car freshener which, to be honest, actually made me feel slightly ill. Fortuitously, I met my friend Lynda (one half of weddingcandles.ie) and she gave me an amazing tip which worked so well that it led me to look up other natural car freshener ideas and put together other tips I use around the house. I have to say, I'm not a purist when it comes to these things, I like my make up and perfumes and lots of things which aren't 100% natural but I am sensitive to chemicals and mostly prefer not to use bleach or harsh chemicals around the house. My favourite products are the Ecover range and if you haven't discovered this already, do check out ecobaby.ie and buy the large quantity - saves money, you don't have to think about purchasing again for ages and it saves on containers too. If you want to be super thrifty and avoid chemicals there are lots of things you can do yourself at home. Firstly, my amazing car freshener tip thanks to Lynda is put rice and lavender in a sock or sachet and leave on dashboard. I actually had a bag with lavender at home so I half filled with rice which absorbs damp and half with lavender which releases a lovely scent. My car was parked out in the sun the other day and when I got in, the lavender was wafting throughout the car, so gorgeous and without the overpowering chemicals that are usually in car fresheners. Baking soda is the best product ever, has a multitude of uses and totally natural. It's a great oven cleaner, just make a paste with some water, spread it around your oven and leave for a while, then wipe clean, works amazingly well! Baking soda is also great for absorbing smells so leave a little tub at the back of the fridge to keep it fresh. 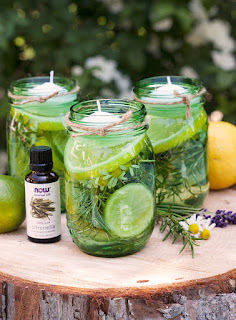 If you have a problem with mold, clove oil is extremely effective, mix a few drops with water in a spray container (you can get these in any garden store or euro shop usually) and spray on to the affected area, leave for a while, then wipe clean. Of course I can't forget to mention vinegar, another super household item with a multitude of uses and here's a great compilation of vinegar uses from the New Homemaker. I always leave my doors and windows open as much as I can, especially in Summer, nothing like fresh air in the house! When things are a bit stuffier, I like to burn my candles or use my aromatherapy melts which release a scent as well as having therapeutic properties. I also use flowers from the garden, they're so beautiful and I try to grow a few scented types of flower so that I'll have some to cut for the house, especially lavender - if you don't have this in your garden, go get some straight away! Great tips, thanks. I always have a pot of baking soda in my fridge but have never tried cleaning the oven with it, must try that out. Yes, it's great, really lifts off the dirt! Loads of great tips and ideas Cliona, thanks for sharing! Especially love the natural car freshener idea, never liked the refreshers you can buy in shops. Thanks Liga :) I really don't like car air fresheners, they're really overpowering sometimes. Lols Sophie, it definitely works, my lavender is a bit old as I've had it for a while but can still smell it in the car. I have loads of lavender in the garden and have been meaning to do something with it so that's a great idea. I love lavender. I might try these tips. they look and sound really good and lemon smells great too! Some fantastic ideas here I like the idea of having natural scents and cleaners. Too many products in the modern world use chemicals which are bad for you. Ooooo Cliona, Ive been after tips like these for ages. We're trying to take the more natural route.